P37 WEB GEAR INSTRUCTIONS COURTESY OF GRANT R. FROM MEDICINE HAT AB. As others have indicated, the free ends of the suspenders (both front and rear) form the attachment points for the water bottle (right side) and the small pack (left side.) But you must have the correct length of suspenders (they were made in 3 different lengths, as I recall) - i.e. sufficiently long to be fed completely through the pouch assembly (whether 'basic' pouches, 'small arms ammunition' pouches, or whatever...) in front, leaving "tail ends" about as long as those in the back. Since a "picture is worth a thousand words" (supposedly) please see my attached "6000-word" pictorial disseration on the mysteries of Pattern 1937 Web Equipment. I have left the images quite large, to hopefully retain sufficient clarity and detail to be of some use, so don't forget to scan right, especially to get the image depicting attachment of the E-tool, at top right. 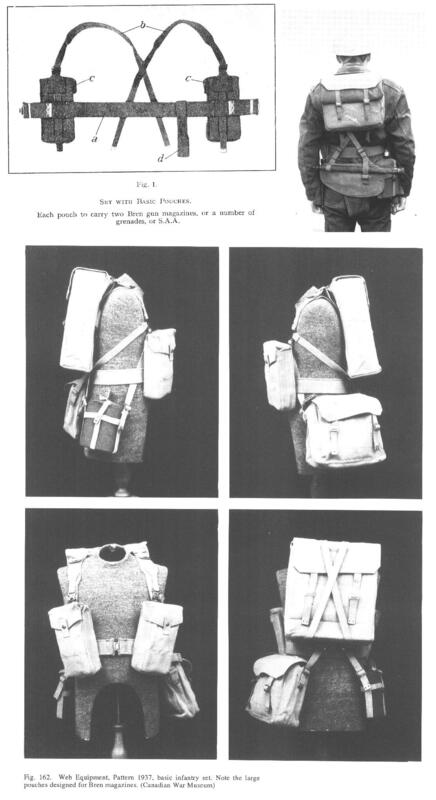 Sorry about the quality of the first (top left) photo, showing the assembled harness with basic pouches to illustrate my point about the "tails". It comes from my original 1940 Canadian reprint of the 1939 British manual "The Pattern 1937 Web Equipment", and actually represents about the best quality of the rather grainy, poor-contrast photo illustrations in the manual! (I intend to reproduce this rather rare manual for the collector and reenactor market, by the way, but the poor quality of the photo-illustrations in the original is causing me some problems.) The rest of the pictures are scanned from "Tangled Web: Canadian Infantry Accoutrements, 1855 - 1985", a very detailed and valuable reference, quite useful to Commonwealth reenactors generally, at least up to and including WWII, since the primary patterns of Canadian Infantry Equipment were pretty well identical to the British patterns until the 1950's. Another pretty good source of photos, showing various "orders" of P37 gear being worn, is Mike Dorosh's "Canuck". ("Tangled Web" can be obtained on-line from Clive Law's "Service Publications" - SEE LINK below pictures ... I think "Canuck" is out of print, but often shows up on e-Bay, and may also be available through Amazon and similar on-line booksellers.) Hope this helps!